Evaluating the risk of owning two homes can be difficult. We call it a “time trap,” because each of the solutions involve expense. It is vital that you carefully assess your needs and options before you proceed. By understanding the risks and costs involved, you can avoid the unexpected and unwanted results that spring from unplanned actions. Evaluating the risk of owning two homes, buy, or sell first, is a common dilemma that homeowners face today. In fact, about seventy percent of home buyers are also home sellers. People caught in this “time trap” are often faced with difficult questions and weighty decisions to make. The first and most critical assessment you must make is to understand your needs, priorities and finances. You are then ready to evaluate your options, choose one that suits your needs and then develop a plan to follow. You will need to determine how valuable each consideration is and base your decision on which approach best meets your needs. We encourage you to discuss your options with family, your lender and your real estate agent before proceeding. Caution: there will be exceptions to these general statements in the Time Trap tool below. To determine which plan best fits your situation, carefully weigh the strategic effects of all the options. Your decision should revolve around the concepts of risk management, financial ability and personal motivation. The couple decided that they should go ahead and buy the new home. They said, “We’ll worry about the old house later”, and made the purchase without a home sale contingency. They moved into the new home, put their old home up for sale, and lived happily ever…Wait! It did not end quite that well. As you may have guessed, the old house did not sell for what the agent thought, and it did not sell within 60 days. Almost two years of mortgage and upkeep payments later, they accepted an offer far below what they expected. As you read this account, you can clearly see what they failed to do to protect themselves at the time. In part, you can see it because you have the benefit of looking at this situation from an objective point of view. Would they have done the same thing if they had it to do all again? It is easy to second guess the situation. Each year, similar scenarios play out this way many times throughout the United States. 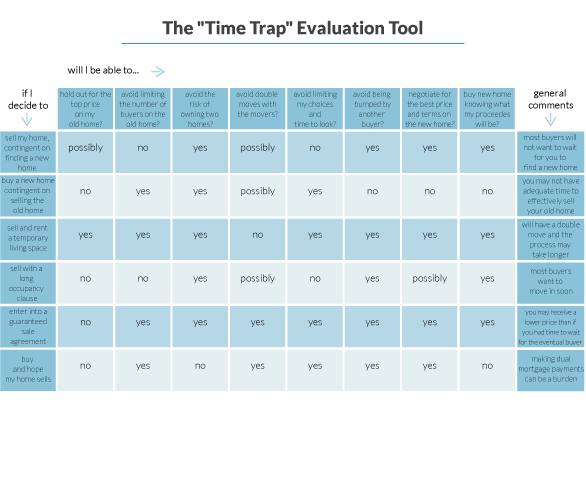 This “time trap” issue can be an extremely difficult one. Because each of the various solutions for this dilemma involves expense, it is vital that you carefully assess your needs and options before you proceed. By conscientiously planning your approach and understanding the risks and costs involved, you should be able to avoid the unexpected and unwanted results that come from unplanned actions. We hope you find this information helpful in navigating your way through it. If you have any questions, ask me.